I prefer to use molted feathers that a bird sheds. It’s kind of like recycling. Nevertheless, sometimes people give me their pet bird that died. Often, an owner who treasured their bird wants to see the feathers put to use when the bird dies—as sort of an honor the bird. So I have learned to pluck and do a bit of taxidermy-type work. It was distasteful at first, but now I see it as just part of life. 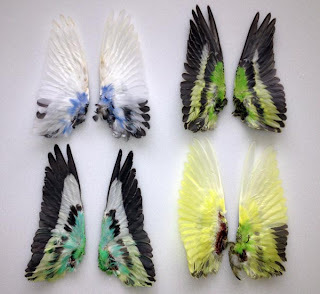 So here are the wings of four parakeets. They curve in a beautiful angelic way, smaller than the palm of my hand.